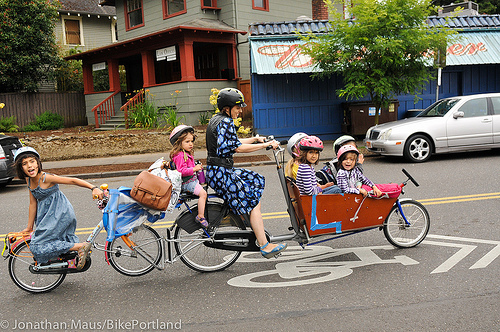 My friend sent me this link to a Portland woman--and mother of six--who transports her entire family using a Dutch bakfiets. It's pretty incredible. I've been dreaming of adding Dutch child seats to my own bike so I can run errands on bike with all 3 kids. This woman takes it to the next level, though. Click to read the article: With six kids and no car, this mom does it all by bike. Do any of you ride a bakfiets, a Madsen, or other type of cargo bike? What do you like or dislike about it? I've never ridden one, but I have admired those Madsen bikes from afar. I think I would feel so virtuous biking! If our carfree experiment goes well, I'll put on one our list of things to save up for. I'm actually thinking of a Trek Bike (www.trekbikes.com) because they seem easier to maneuver. Oops. I was actually thinking of these long tail cycles: http://www.xtracycle.com/what-is-a-longtail Ignore my previous link. We have a Workcycles bakfiets like Emily in the above story. We love, love, love it and ride it almost every day. It takes only about a block to learn how to ride and then it's super easy and comfortable-- even with three kids in it. Our youngest began riding at just a couple of months old in an infant seat strapped into it. I aspire to be a biking mom. Thanks for the article link. I ride an extracycle with two kids and it works wonderfully. I have a radish, which is kindof cheap, accessory wise. If I could do it again I sould have gotten the Surley. But, you could not pay me to use a bike trailer again. I have a friend who uses a tagalong with the extracycle and that works fine too for three kids. My 6yo started street riding on his own with me about a year ago, but I still put him on the extracycle for long hauls. We also can do a full grocery store trip with it and the two kids. Its great. That's pretty awesome. I just have one question: why doesn't she just take the younger kids with her bike and every kid who can ride by themselves, rides his own? I think it's awesome that she's riding with her kids. I ride often with my son as well, although he's in his bike trailer. What pissed me off about the story, however, was how poorly those kids were wearing their bike helmets! Helmets should not be able to wobble around like that on a head - they should be fit snuggly and NOT move around. The whole point of wearing a bike helmet is that it protects the head in case of a fall. If the helmet is loose and moves around, it cannot protect the head properly. What I can't figure out is what car-free bike families do with little babies from say, newborn to 6 months. I'm currently going car-free as an experiment and I'm due in the winter (I also have a 2 year old and a 4 year old). If the experiment continues, we'll have a newborn and I plan on going with the public transit option during the pre-sitting on their own stage. I wouldn't even try a seat on the back, or the "Co-pilot" LOL. I'm a wimp. I did see a dad here on a triple tandem pulling a double trailer. Or maybe it was a tandem with a co-pilot pulling a double trailer. Either way, he had (at least) 4 kids behind him. And I thought babywearing was great fitness, LOL! I would never be able to do this. I'd be a nervous wreck about getting hit by a car. Even if the chance was low, I just know I couldn’t do it. I would only be able to do this in a country where biking was the norm and cars were rare. We have the WeeRide center mount seat. We've used it for all 4 of our kids. I love it, and I love not pulling a trailer. We have also used Madsen bikes which are great... they are very easy to pedal, maneuver and can hold 4 kids. I'm with the other poster tho about having the older kids ride themselves.... at least 2 of those kids could be on their own. Also.. they need a helmet check! Why am I up at 2 am?